Join us on August 9th from 4pm to 9pm as the Historic Woodstock Square is transformed into The Wizarding World of Woodstock. Enjoy free entertainment & crafts, shopping, dining, free kids activities and family fun to celebrate all things magical…and muggle! Local shops and landmarks will mimic some favorite places from the books, kids activities/crafts hosted by the Woodstock Public Library and local businesses will include living scavenger hunts, house sorting, monster, owl and snitch crafts, quidditch in the park, trivia, costume parades and more. Photo op locations around town will add to the fun and memory making! 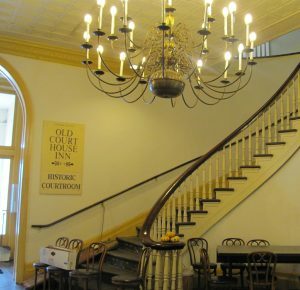 Visit the Old Courthouse and take a selfie in our “Courthouse Cupboard ” photo op! Find the perfect wand, as well as other accessories no witch or wizard should be without. See if you can find all the people in our living scavenger hunt, or dress up yourself! Stop into participating businesses to find out how they are putting their own spellbinding spin on this entrancing event. Support the Old Courthouse when you buy an official Friends of the Old Courthouse broom. For more information, visit the Woodstock Library’s event page.